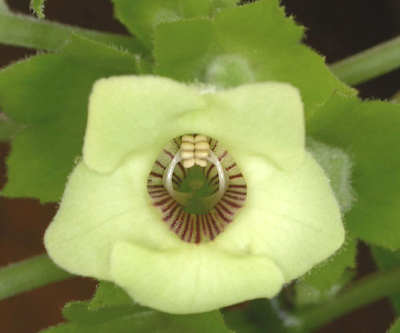 This picture is of Marilyn Allen's plant exhibited in the 2005 convention show in Portland. Note the strong resemblance to Sinningia guttata, including the shiny green serrated leaves and the leafy-green tubular calyxes. The flowers and flowerbuds turn to face the light source, just like those of S. guttata. Another similarity is that the flowers have a definite fragrance. The scent of this species is most pronounced at night. To my nose, it is stronger than that of S. guttata. This photo, from Dale Martens, shows the mesmerizing interior of the Sinningia lindleyi corolla tube. 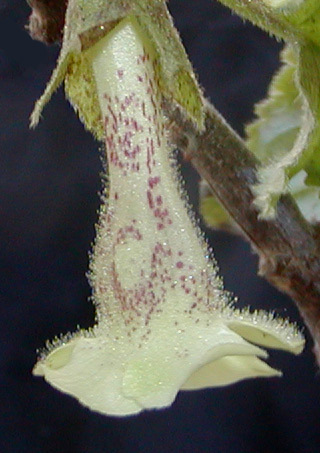 Note the four pairs of anthers at the upper surface of the tube. 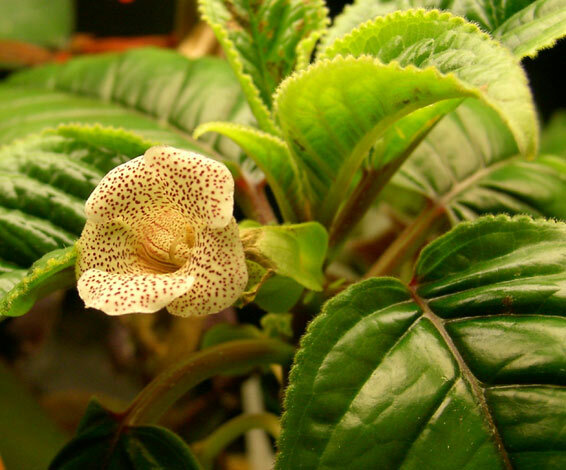 I used to have two plants of S. lindleyi grown from cuttings I received from Bob Stewart at the 2007 Gesneriad Convention in Miami. One I put outdoors, the other indoors under lights. 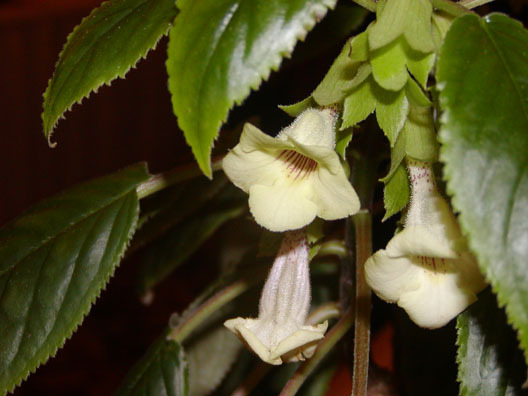 The indoor plant bloomed in 2008, but the foliage was not what one would call attractive. I expected the outdoor plant to succumb during the winter, but it did not. Therefore, in 2009, I put both plants outdoors. The one which spent the 2008-2009 winter outdoors came into bloom in October 2009. The flowers of S. lindleyi are very attractive. In addition to the streaks on the inside of the corolla tube, there are spots on the top of the tube, as shown in this picture. An interesting feature of the woody stem is the vertical striations. They resemble the markings on the stems of Paliavana tenuiflora. I do not know what the significance of the markings is. It looks like maybe the bark is splitting. 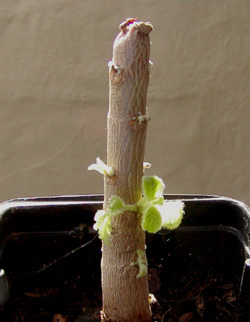 In the winter of 2008-2009, I had two plants, one indoors and one outdoors. The indoor plant is shown at the left, the outdoor one (picture taken March 2009) at the right. Both were mostly thick, bare stems, with the indoor one somewhat taller. In a certain sense, it appears that this trunk is acting like a tuber. 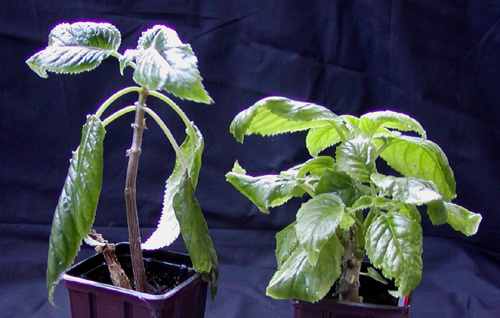 In the spring, the two plants resumed growth, but not in the same way. My indoor plant put up a new shoot from underground, beside the base of the trunk, the trunk then withering. On the other hand, my outdoor plant put out new shoots from nodes along the trunk. The results can be seen in the photograph below, taken July 2009. The indoor plant is on the left. It was being grown in a sunny window, while the outdoor plant was in deep shade. Quite a difference in the amount of foliage! Unfortunately, both plants expired several years ago. This is not an easy species to grow. This is Peter Shalit's picture of his own cross, S. lindleyi x guttata. The spots are from S. guttata, the creamy color from S. lindleyi. As far as I know, this is the first hybrid involving S. lindleyi. It's a real accomplishment, since S. lindleyi has a reputation as a reluctant bloomer. One can hope for more hybrids to capture the yellow in the flower. 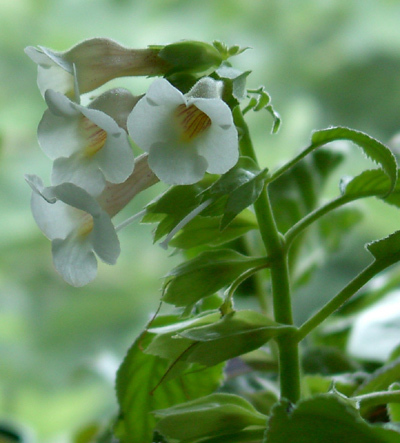 This picture shows one of the plants that Peter obtained by selfing S. lindleyi x guttata. This F2 has corollas that greatly resemble S. lindleyi in the unmarked corolla limbs and reddish streaks in the throat of the corolla. At least in this picture, the corolla looks white, while that of S. lindleyi is a cream color, not exactly yellow but not white either. The tubular calyxes, however, are all S. guttata. Those of S. lindleyi are shorter, glossier, and more flaring. Inflorescence Flowers borne in leaf axils. Flower White, funnelform, reddish stripes in throat, reddish spots on top exterior of corolla. Fragrant. Hardiness One plant survived (although almost leafless) outdoors, through near-freezing nights. Taxonomic group In a subgroup by itself within the Sinningia clade. This species was originally published as Sinningia helleri by Lindley, in 1826, but a Sinningia helleri, the type species of Sinningia, had already been published by Nees in 1825, so Lindley's name was invalid. It worked out okay for him, however, because Schauer published the name Sinningia lindleyi in 1834, and that name has stuck. It appears that the actual Sinningia helleri be related to this species, as many of their properties are similar.